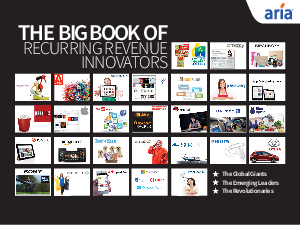 This first-of-its-kind e-book on Recurring Revenue Innovators showcases 29 real-world examples of smart businesses that have boldly exploited recurring revenue business models to expand markets, boost sales, and reap greater profits. These daring recurring revenue innovators, many in the Fortune 1000, offer inspiring case studies on how to use recurring revenue models in new, innovative, and impactful ways. These cutting-edge companies are using recurring revenue to disrupt their markets or carve out new ones. You will find familiar names like Amazon, United Airlines and ESPN, under-the-radar surprises like Ingersoll Rand’s Nexia home automation service and Philips’ Community Without Walls, unexpected upstarts like BarkBox and Entitle, and market disruptors like Stitch Fix and Blue Apron.